Email has become a very important platform to communicate with the masses. Be it an individual or an organization every user has become fond of using emails for sending emails, items such as journals, contacts, notes, etc or some crucial documents or attachments. Since email has become a universal and commonly available method of communication, there has been a continual competition between email applications and email clients. As the number of email platform and clients has been increasing the demands and different option for the users are also increasing as a result to which most the users are shifting their domain to is the EML to Outlook PST files conversion. Microsoft comes with wide amazing software applications such as Outlook and Window Live Mail. Both this Microsoft application support two different file format i.e. Outlook supports PST files on the other hand Window Live mail supports EML files format. All of this EML files are also supported by a number of different applications such as Apple Mac OS, Linux, Mac OS X, etc. However, due to corruption, unexpected shutdown or system crash and human error may damage or dismount the EML files therefore to avoid such issues the user’s converter EML files to PST files format. How to convert EML to PST file format? Due to the difference in both the file format it gets difficult for the user to convert EML file to PST formats easily, therefore, in order to make this conversion possible users are given with two methods to convert EML files to PST format. One is the manual method and another is the third-party methods i.e. 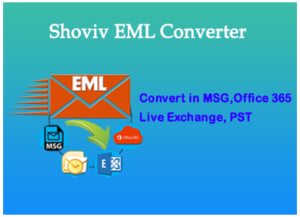 EML to PST converter software. Though, we avoid using the manual methods for the conversion of EML to PST files because of the disadvantage which comes with the manual methods. Therefore, for the conversion of EML to PST, we will be discussing the third-party methods i.e. EML to PST converter. Before moving any further let us discuss the demerits of manual methods. The manual method is the free ware solution that consumes lot of user time. In manual methods there are chances of data loss and corruption while working. The manual methods cannot be used by non-technical user as they require technical expertise and knowledge of the program. They do not provide desire results with satisfactory outcome. Since the EML mailbox consists of crucial data and important attachments or files, therefore, it becomes necessary from the user end to avoid any corruption of files and data loss in order to keep EML files safe and secure. By using the third-party software solution the user can effectively convert EML files to PST file format easily and without any loss of data. “Open” the software and go to add EML files in the ribbon bar. After the EML file has been added the user need to select the EML file. And “Go” to ribbon bar and select the “Export to Outlook PST” button. After selecting on PST files the user. The dialog box will appear in which user are required to fulfill the details based upon “Export Type, export target and export criteria”. After the process has been completed select “Save” report to save the report and then “Finish” the program. The third-party EML to PST software is the safest and secure way to convert EML files to PST file format without any hurdle. The software comes with amazing features which not only convert EML to PST but also save the EML files into HTML, and MSG file formats. The software is easy, swift and comes with a user-friendly interface which effectively converts EML files to PST files. Support different applications such as Apple Mac OS, Microsoft Windows, Linux, Mac OS X. Rapid transfer of EML files to PST file format. Export EML to Live Exchange Server and Office 365. Large PST files into small PST files without any limitation. Free demo mode to assure product quality and assurance. Because of Outlook popularity and better services user shift their EML file to PST file format. Therefore for the user which is searching for shifting their domain from EML to PST file format, the EML converter is the best solution for the converting to EML to PST.